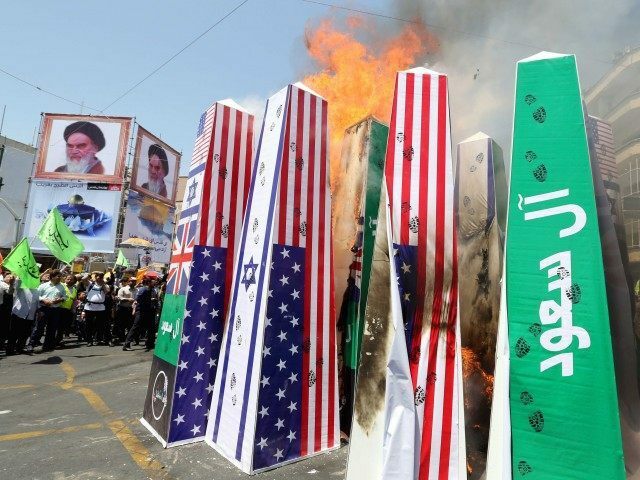 Diplomats at nuclear talks in Vienna failed to reach an expected deal on Friday, as Iran balked at signing an agreement with the Western powers on “Quds Day,” an annual day of virulent protest against the U.S. and Israel that the Iranian regime stages throughout the world. Though negotiators had suggested a deal was hours away, the Iranian team balked, perhaps wary of contradicting the message that the regime was broadcasting in officially-backed demonstrations in Iran, and in demonstrations staged by Iranian proxies in other countries. Quds Day, named for the Arabic word for “Jerusalem,” is held during Ramadan, and traditionally features bombastic shows of intolerance towards Israel, as well as anti-American slogans, the burning of the U.S. flag, and other manifestations of religious and political fanaticism. Throughout the talks, the regime has continued its anti-American rhetoric, which the Obama administration has dismissed as propaganda for domestic consumption. However, on this occasion the idea of reaching a deal with the “Great Satan” may have proved a stretch too far. The U.S. continues to remain at the table, determined to stay as long as it takes to reach a “good deal,” according to the Obama administration. President Barack Obama has said the chances of a deal are less than “50-50,” but sources say an agreement is close.